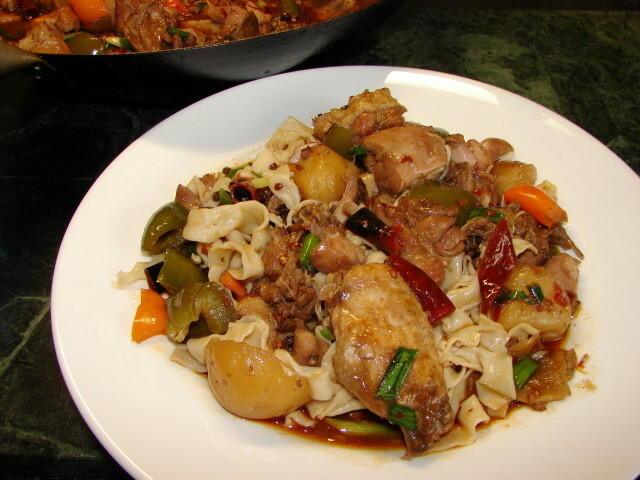 Xinjiang da pun ji 新疆大盤雞, translated as Xinjiang big plate/bowlful of chicken. Xinjiang is the North West part of China, Muslims majority. I found this chicken stew recipe a while ago, very similar to Sichuan spicy flavour which I like a lot. What special is no water is needed just plenty of beer to stew the chicken. I just got to try this recipe. Here is a big wokful of this stew, colourful and spicy, nicely flavoured too. This stew is eaten with flat noodles not rice. I like it. 1 - 1.25kg of chicken with bone, cut/chop into chunks Chinese style with a cleaver or cut with pair of scissors. I used half a large chicken. You can also use drumsticks or chicken legs. Put oil in wok, fry the Sichuan peppercorns for a little while till fragrant. (You can remove Sichuan peppercorns if you hate biting into them, crush some with pestle and mortar and add to the stew later) Now add cumin, star anise and dried chillies. Stir till you get a pungent scent and before chilli burnt. Add garlic, ginger and onion, stir for a little while. Add chilli bean sauce, stir till oil turning red. Add chicken and stir fry for about 5 minutes. Add beer. Cover and let the liquid come to the boil. Turn the heat down and simmer for about 20 - 30 minutes till chicken and potatoes are tender. Season with enough light soy and sugar. Taste before adding light soy, chilli bean sauce can be salty. Add green chilli or sweet pepper. Continue simmer for another couple of minutes. Thicken with slackened cornflour. Not too thick. Mix above together to form a dough. If dough is very dry add a bit more water. Dough should be firm. Leave to rest for about 20 minutes, knead till smooth. Cut dough into 3 pieces. Dust with plenty of dry flour then roll out thin with pasta machine. Then hand cut with knife into thick flat noodles. 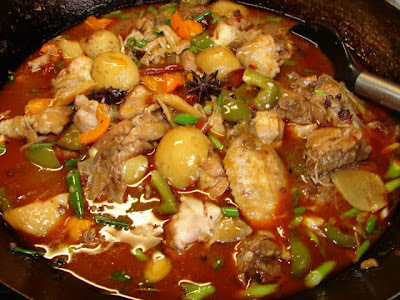 Boil and serve with chicken stew. *The flavour of the stew sauce was bitter (due to the beer) at first but did mellow down to a nice rich flavour with all the other ingredients. Ooh, this sounds right up my street, thanks for sharing. PS Did you get my email the other day? No hassle, just want to make sure you received it. I had this dish at Silk Road in Camberwell, and the hand-made noodles were SO moreish. Glas to see there's a recipe for it now! I will definitely be trying it. Good to know this spicy chicken stew noodles has reached restaurants here thought this is only available in China unless home cooking. I've not come across this chicken stew before but it looks so delicious! Thanks for the recipe! Thanks for this recipe. I've also had this dish at Silk Road and have been searching for a recipe for ages! Can't wait to try it!